The Golds Gym Trainer 410 Treadmill aims to burn calories and help users lose weight, hence it is designed with features and accessories that provide performance and weight-loss goals. Aside from the cardio workout it offers, it is also designed to tone the upper body, giving its users a pair of hand weights to use during workouts. Among the features present in the Trainer 410 treadmill are QuickSelect Speed Control, QuickSelect Incline Control, 2.0 CHP G-Force motor, AirStride Plus cushioning, and more. 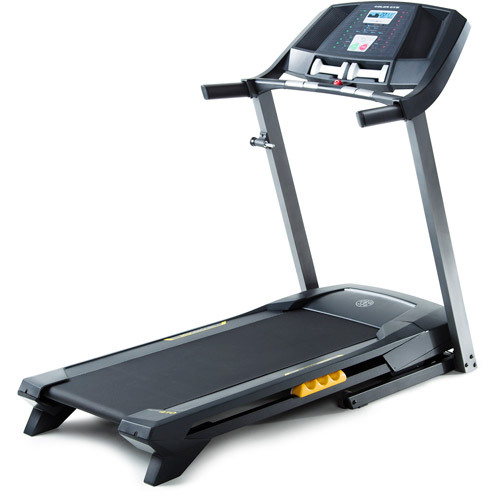 If you're looking for an affordable treadmill that you could use for walking, then the Golds Gym Trainer 410 treadmill is the one of your options. With its relatively inexpensive price, it is worth trying out. The Golds Gym Trainer 410 treadmill is equipped with features that will help you achieve your fitness goals with very affordable price. Its 2.0 CHP G-Force motor is quiet and has a self-cooling drive system that is noiseless. Through its built-in axial fan, the internal parts are not easily heated up. So, no matter how long you use your machine, it will stay cool and quiet. The machine features a QuickSelect speed control that allows users to choose a speed between 0 and 10 mph with just an easy touch of a button. Moreover, it also has a QuickSelect incline control between 0 and 10 percent incline. These features give options to user as to how fast and steep their run would be. Built with a tread-belt that measures 18” x 50” which is pretty normal for this price range, walking, running, and striding in the Trainer 410 should be easy and natural. Whether you choose to walk or run (though we don't recommend it), this machine provides ample room for any of your cardio work out routine. Moreover, the Trainer 410 is designed with the AirStride Plus cushioning feature that is made up of uniquely shaped isolator. This aims to lessen impact on your joints and provide you with a more comfortable workout. Featuring a total of 8 workout apps, depending on your workout objective, you can choose from either 4 weight-loss routines or 4 performance exercises. These workout programs were designed by a certified personal training expert to give you variety in your workouts. 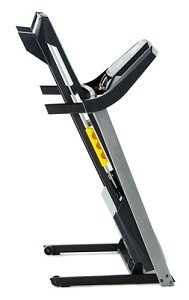 Other features of the Gold Gyms Trainer 410 treadmill include the SpaceSaver design that lets you fold it vertically for storage, a large LCD display where important workout stats are displayed, and dual-grip PowerPulse heart rate monitor among many others. The cheap price of the treadmill will not guarantee you a high-quality exercising machine. Also, it takes quite a long time to assemble. For extreme runners, stay away from this machine. It is not built for running. The speed and quality of the treadmill might not be enough to satisfy the challenge the runners want. Also, watch out for higher speed; the treadbelt might slip. 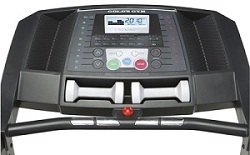 Belt Size: 18" x 50"
If you plan on buying a Golds Gym Trainer 410 Treadmill, I suggest you buy from Walmart.com. They usually sell this for just $377.